These are some serious muffins. 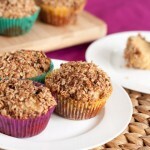 They share a strong resemblance to cinnamon buns with an apple crisp type topping. They are fantastic sprinkled over ice cream, overnight oats, or a big bowl of morning smoothie! Preheat oven to 350F and line a muffin pan with 8 muffin liners. Place a couple of tablespoons of water in the unused tins to prevent your muffin pan from burning. Set aside. Mix oats, coconut sugar, cinnamon, coconut oil, and coconut in a small bowl. Set aside. Combine almond flour, coconut flour,baking soda and salt in a medium bowl. In a large bowl, blend together eggs, coconut sugar, coconut oil, milk and vanilla. 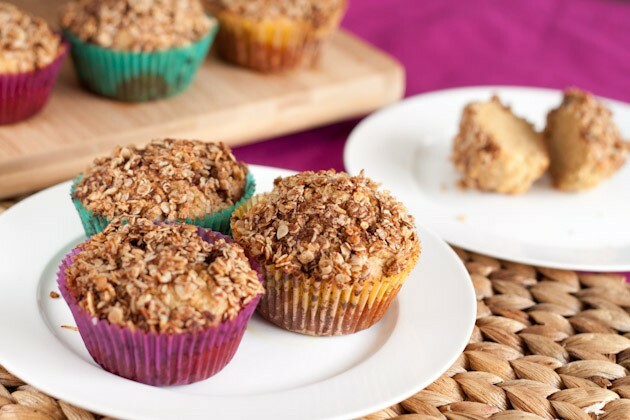 Blend dry ingredients into wet and scoop a 1/4 cup at a time into prepared muffin cups. Spoon topping onto muffins and bake for 20-22 minutes, or until toothpick inserted comes out clean. Allow to cool in the tin for 3 minutes before removing to a cooling rack and allowing to cool for an additional 10-15 minutes. Recipe can be made grain-free and paleo if chopped pecans, walnuts, or almonds are used.